A “healthy” baby has been born in the UK, from an embryo screened for genetic diseases, using karyomapping, a breakthrough testing method that allows doctors to identify about 60 debilitating hereditary disorders. “Lucas is absolutely perfect. He is really big for his age, and healthy. I have peace of mind now that he is going to be OK,” said mother Carmen Meagu, who suffers from Charcot-Marie-Tooth, a genetic neurological condition. The disorder, which affects about 25,000 people in the UK alone, typically causes loss of muscle tissue, control and sensitivity in the lower extremities. Meagu, 26, was told that she had a 50 percent chance of passing the condition onto her child. Meagu then began a course of IVF, when her eggs were fertilized with the donor’s sperm, outside the body. Once the embryo grew to several dozen cells, still in the lab, technicians took a sample of the genetic code of the new embryo, and scanned it again, to see if it inherited the abnormal code from the mother. After three months of treatment, beginning in December 2013, one of the healthy embryos took, and Meagu became pregnant and gave birth to Lucas on December 18 last year. “I obviously worry, like all mothers, but now I worry about normal things. I know for sure that he is not only free of Charcot-Marie-Tooth disease but also other illnesses,” Meagu said. 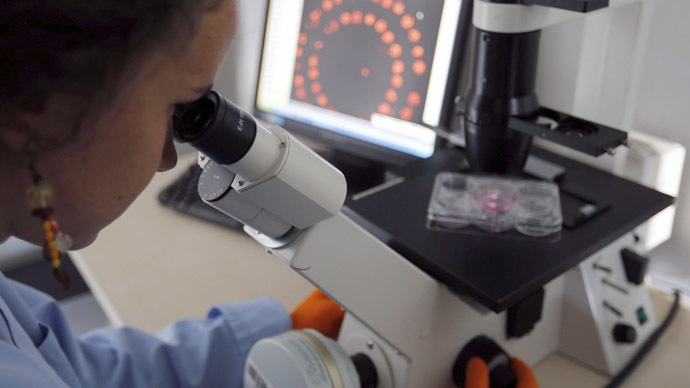 So-called Preimplantation Genetic Diagnosis (PGD) already exists, but is currently a cumbersome and expensive procedure. Doctors have to create a specific screening test for each couple, and the process takes several months, prior to any IVF treatments. Contrastingly, the new procedure is relatively simple, and can be completed within 24 hours, meaning it can happen concurrently with IVF. The first worldwide karyopmapping-aided birth was announced in January 2014. In the UK, the test will now be available for free on the National Health Service. It is estimated that up to 5 percent of all children born each year suffer from an undesirable genetic condition - and the number would be even greater if not for the invasive and often traumatic medical terminations through pregnancy. Dagan Wells, from Reprogenetics UK, the company that tested Meagu’s DNA, said that karyomapping was the “single biggest technological leap” in at least two decades – but not the last one. "We are entering a golden age of genetics applied to the understanding of infertility, early human development and the diagnosis of inherited disease. Several other major technical advances are now on the verge of routine clinical application and the landscape of IVF is likely to be radically altered in the coming months and years," he told The Guardian in an interview last year.